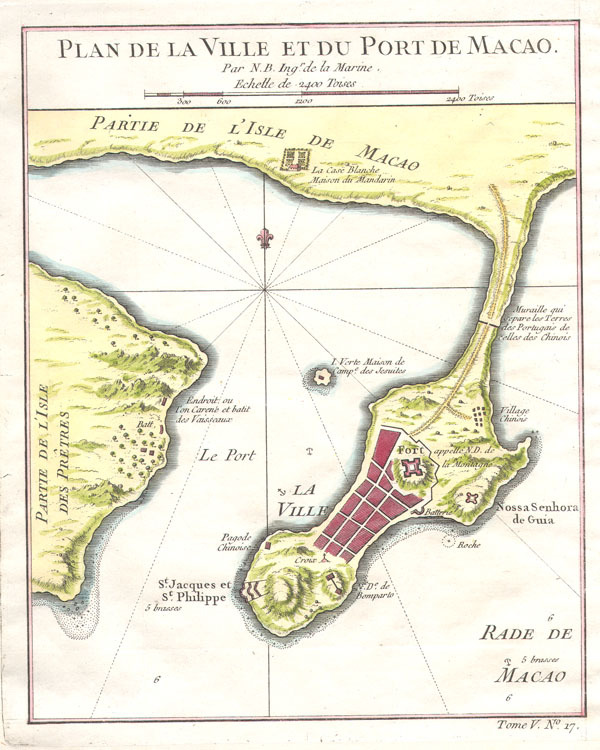 This is a rare map of the city and port of Macao (Macau) dating to 1764 by Jacques N. Bellin. This map is one of the earliest depictions of Macao's street structure. Shows fortifications, roads, several important buildings, the fort, and a Chinese village near the Portuguese city. This map was issued as map number 17 in volume 5 of Abbe Prevost's Historie universale des voyages. Varients were also issued for Bellin's Petit Atlas Maritime and Nouvel Atlas de la Chine, de la Tartarie Chinoise. Very good condition. Blank on verso. Original platemark visible. Library of Congress, G7823.M2 1764 .B38 TIL.